Recently past Mayor Mark Brown presented cheques to his two chosen charities Waves and Seahaven Storehouse. The money was raised throughout Councillor Brown’s Mayoral year at various events including the Mayor’s Garden Trail, Mayor’s Christmas Carol Service and the Mayor’s May Day Charity Ball. It was then equally split with a total of around £2430 raised for each charity. The past Mayor also supported both charities through the year at their own events. He especially enjoyed the Waves Family Picnic and Fun Day and assisting with multiple food collections at Morrisons for Seahaven Storehouse. 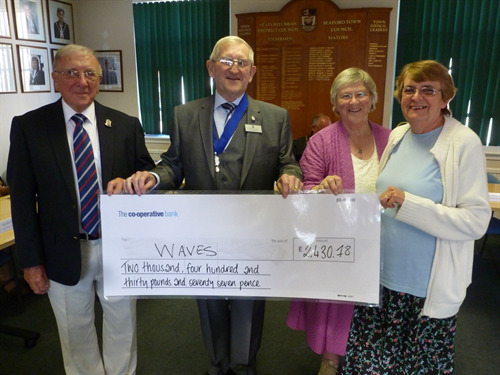 WAVES representative Roy Garrod said "WAVES express their grateful thanks to the Mayor and his good lady wife for all their support throughout the year which resulted in such wonderful sum being raised, enabling us to carry on work of helping families in our town of Seaford. In expressing our gratitude for the money raised we would also thank them for the moral support and encouragement they gave us throughout the year." 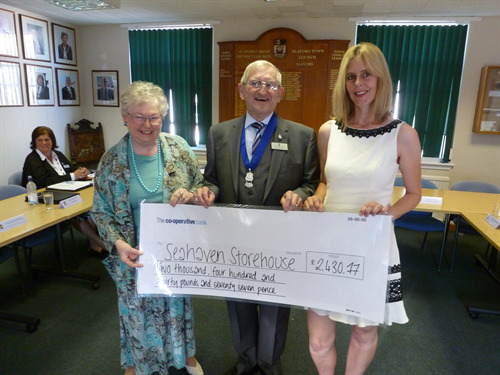 Head of Seahaven Storehouse Dawn Woodgate said “We are so grateful to Cllr Mark Brown for his help and support over the two years we have been in operation. We have greatly benefitted both from receiving this wonderful cheque, which will give us funds to help feed needy families, and also from the extra publicity which has given us greater visibility locally. We have immensely enjoyed working with Mark and are looking forward to our continued association with him."